Established in 2012, Bedford and Main offers a distinct value generated from the depth of real-life, hands-on experience we bring to the table. Our consulting services are based on experience and commitment. In fact, we are proud to note that we have not been simply consulting for 35 years. And, we are not “consulting” to fill in a career gap before the next job. We have been actively building and growing brokerage firms, both introducing broker-dealers and clearing firms. We have established trade execution, clearing, and custody relationships around the world. We have coordinated the integration and consolidation of independent brokerage firms. We have developed the RFPs, and reviewed, chosen and installed domestic and global security processing platforms for self-clearing broker-dealers and FCMs. Not to mention installing Security Lending, F/X, Corporate Actions and many other industryrelated third-party platforms. We have helped build new broker-dealers from scratch, restructured existing firms, and closed down others (frankly, setting them up is a lot more fun!) Our CEO has been honored to serve in the roles of SVP, MD, CFO, COO, President and CEO of successful firms. We are based in the metropolitan Philadelphia area, but our client base is global. We appreciate the opportunity to discuss any scope of engagement, and we pride ourselves on delivering results. About the picture: Anyone that has been in this industry for a while will tell you two things. First, it's a small world where everyone has mutual contacts and connections, very often with roots that go back to working together through their careers. Secondly, long term relationships are at the heart of the industry. Honoring the values of deep roots and relationships, we picked Bedford and Main for our company name. 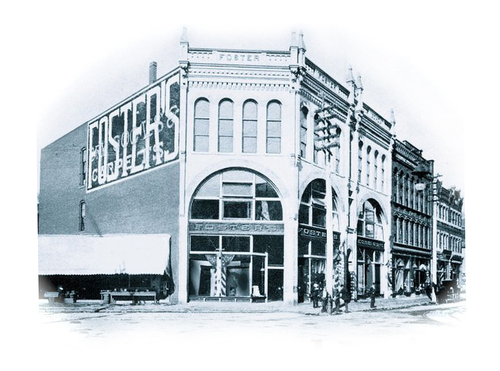 From the late 1800’s through the 1960’s, Foster's Dry Goods Store stood at the corner of Bedford and Main in Johnstown, PA.